Just about every visitor to Acadia National Park takes the Park Loop Road, a 27-mile loop that winds southward along the rocky coast, then turns inland and heads northward through the woods. We did the coastal part of the loop, stopping often at turnouts offering views of surf crashing against rocks at the base of pine-covered cliffs—the iconic Acadia postcard shot. When we made the inland turn in the loop road, we stopped at a parking lot near Jordan Pond, changed into our biking clothes, and did our inland park sightseeing the way John D. Rockefeller Jr.'s guests did—by carriage road. 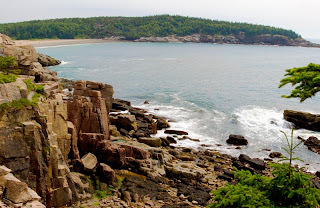 John D. and his wealthy friends who summered on the island set aside the land for Acadia National Park back in 1901, and today it remains the only national park comprised entirely of donated land. Rockefeller's favorite way to tour the island was on carriage roads, and he viewed the arrival of cars on Mount Desert Island in 1913 as an event that had the potential to destroy his vision for the park. Undaunted, he spent the next 27 years building winding scenic carriage roads all over his property. Gently graded and covered with crushed stone, the 45 miles of carriage roads he built are still car-free today, and a wonderful way to explore the woods and inland waters of the park. We followed a helpful ranger's advice, and started our adventure with a 3 mile loop around Day Mountain. We used all our gears on that one, and learned that "gently graded" was a relative term. 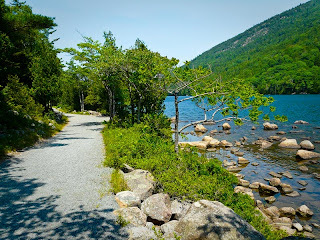 But we were up for more adventures, so we continued on a longer loop that took us over hills and dales, past panoramic views and downhill to the shore of Bubble Pond, so named for two bubble-shaped mountains along its shore. We had a picnic lunch beside the pond and then continued on the very hilly trail to Jordan Pond. We first spied the pond from high above, after a long climb high on the side of a mountain. 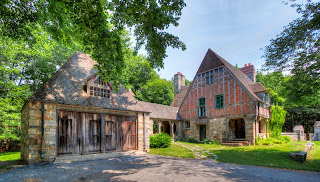 One of the best parts of the ride was our flying descent down to pond level, followed by just one more small hill that took us back to the elegant Carriage House at the entrance to the carriage trail. We couldn't have had a better day for a ride, although the temperature did climb to ninety degrees by the time we were done, and some of the natives were complaining about the heat. We knew the perfect antidote for heat, especially after a caloire-burning bike ride--ice cream. So on our way to our next adventure at Jonesport, we stopped at a roadside ice cream stand and ordered cones. They were exceptionally good, and we learned why--they serve Gifford's Ice Cream, a Maine company which has been judged world's best ice cream three times at the World Dairy Expo.